Natasha McKenna was diagnosed with mental illness at age 12, yet lead a productive life and had a child. She died a cruel and painful death in custody. Natasha McKenna, a 37-year-old Virginia woman, died five days after deputies shocked her four times with a stun gun while she was handcuffed. 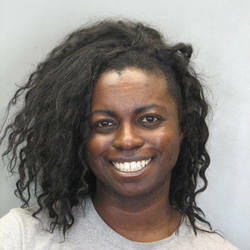 A statement released by the Fairfax County Sheriff's Department said that on January 26, Natasha McKenna was brought to the Fairfax County Adult Detention Center and charged with assault on law enforcement. Then, on Feb. 3, while she was being "prepared" for transfer to the Alexandria Adult Detention Center, she "physically resisted" deputies' commands and was stunned with a Taser, according to the release. She's shackled. And then tazered. Her last word were, "You promised you won't kill me". They tell her "We're your friends". Then yell, "Stop resisting" a few times. And then they kill her. Shortly afterwards, McKenna, experienced a "medical emergency." She was transferred to a hospital and put on life support. Five days later, she died. On September 10, 2015, the Fairfax County Sheriff's office released that shows four to five officers restraining an unclothed Mckenna with Tasers drawn. The video shows McKenna was shocked four times. Forty minutes into the video, McKenna loses consciousness, and employees of the sheriff's office perform CPR. McKenna died five days later. ONLY ON FOX 5: The family of ‪#‎NatashaMcKenna‬ says they believe video of the mentally ill inmate's struggle with Fairfax Co. deputies was edited. McKenna's sister told Allison Seymour FOX 5 DC that she fainted when she saw the video. "I hit the dresser, knocked one of my tooth out. I was shocked," she said. Natasha death has been lied about and spun by police brutality apologists for months. Several sources explained to NBC that police detectives had been constantly denied access to the Fairfax County jail as part of their investigation into McKenna’s death. To make matters worse, the police have yet to even explain why Natasha McKenna had been locked up in the first place. But when you shock someone four times, it is clear that you mean to harm them, intentionally. But McKenna wasn’t just shocked. Both of her eyes were blackened one of her fingers was amputated or missing and there were several bruises running up the length of her arm. McKenna was intentionally beaten, repeatedly, while she was handcuffed and shackled. Looking at the chair used to restrain her, it’s clear to me that she was tortured. Outraged about Natasha McKenna? Fairfax County Sheriff Stacey Kincaid has some timely advice for you. All investigative files and evidence analysis in the Virginia tasering of an inmate were turned over to the Office of the Commonwealth's Attorney for Fairfax County for review, Fairfax County Police Department said Monday. On Wednesday, July 22, the Fairfax County Police Department announced that it had completed its investigation into the death of McKenna. No charges have been filed. On September 8, 2015, McKenna's death was ruled an accident by Fairfax County, Va. authorities, according to NBC Washington. The Fairfax branch of the NAACP organized a “Justice for Natasha McKenna” rally with about two dozen protesters gathering outside the Fairfax County Courthouse on Sunday, September 27, 2015 to call for changes in the county’s law enforcement and legal systems following the death of McKenna.